Yesterday I released 2 more pairs of boots, and several skins. Unfortunately, I was unable to post anything about it here because the store got majorly packed and things were very hectic. One of the pair of boots was a limited edition, and sold out pretty fast. I also had them in a limited edition lucky chair that had campers all day (only downtime was when LL had everything down). They proved to be a huge success! These are the Limited Edition Alice In Wonderland Sketched boots. They come with 6 different textures from the classic book, as well as coloring options as well. These have proven to be a great addition to the store, as nearly the same amount of people clocked to the store as did when I had my L$10 sale a few weeks ago. Only this time, the sim did not crash! The others, were skins from my old store that have had several requests for a come back! In the next several days, I will completely burry myself into creation as I prepare for 2, yes TWO hunts! I never thought even 1 was interesting, and the POE hut was chaotic, but I decided to do the Vain Valentines hunt this year anyways. On top of that, I have had many people say that they wanted to have a small hunt at the regular store, so Genie and I will also be having a small 2 store Valentines hunt. Also, I have been asked to donate something for the grand opening of the new HQ of the Love/Hate blog, so i am going to throw something together for that. You all should know by now that i don't like to recycle my designs. If i donate something or participate in a hunt, it has to be fresh! So i will be creating at minimum THREE brand new designs! 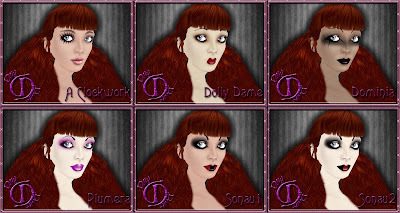 Join the *Dilly Dolls* store group, or tap the subscriber if you want to keep up to date!